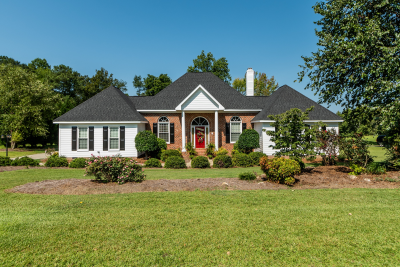 BEAUTIFUL Custom Built Home with a DETACHED GUEST HOUSE on a FLAT acre of UNRESTRICTED land! Main House is 2101 sq ft and Guest House is 1078 sq ft. If you are looking for a home with an "in-law suite", a place for your college aged child, or rental potential-THIS IS IT! Original Owner built this home and left NO detail overlooked! Three bedrms/Two and a half ba in main house. Master Suite is spacious and inviting and Master Spa has dual vanities, stand up shower, and jacuzzi tub for relaxing at the end of the day. Kitchen is beautifully appointed with SS appliances, an island, an eat in Breakfast nook, and tons of cabinets/storage. Open Family Room with fireplace is perfect for entertaining! Dining Room! Two Secondary Bedrooms with oversized closets! AMAZING Screen Porch and Deck! Laundry Room/Mud Room just off the Garage! Additional Owners Entry beside the 2 Car Garage! TONS of Storage in the Garage as well as Unfinished Storage above the Garage that could also be finished into a Bonus Room! Storage Shed Conveys! Entire home/guest home was just painted Aug 2018. Situated perfectly on a corner lot with two driveways! COUNTRY LIVING just minutes from it all! ***************************************************** AMAZING Guest House/In-Law Quarters boasts 1078 sq ft and has it's very own entrance! It has a Fully Equipped Kitchen, Eat-in Nook, Family Room with a fireplace, Spacious bedroom, Full Bathroom, Laundry, and a Large Covered Back Deck for relaxing! Currently Rented but tenants are extremely reliable and are on a month to month agreement with the current owners! This is truly a ONE OF A KIND home! NO HOA!